The Thorn, by author Daron D. Fraley, explores the possibility of life on other planets who share a Creator and Redeemer with Earth. To quote Daron, “What if people living on another planet, one of God's other creations, are waiting for Christ to come visit them?” This premise is a fresh idea in the world of fiction. Because I love fantasy, I have been interested to see how Daron would connect the two worlds--the similarities and differences that would be inherent in each. You can read a synopsis of The Thorn on Goodreads. Parents need not fret about letting their teens read this book. The language, romance and content in The Thorn is G-rated. Setting-Daron’s descriptions of the cities and countryside were pleasant. The cities and other places the characters visited felt real and believable. Characters- While I definitely appreciate a sensitive male protagonist, the male characters in The Thorn came across as emotionally unstable, sometimes weeping to each other. The women in the story felt selfish and spoiled, though I do not think that was the intent of the author. I am a fan of strong female characters and I found the women in The Thorn to be very flimsy, letting their circumstances control them, instead of acting for themselves. The romances in the story were emotionless and flat. I felt no “angst” for the characters and could have done without this part of the book (and I love a clean romance). Although this may be nitpicking, I found the character’s names confusing (for example: Daniel, Rachel, Benjamin, Mannasseh). 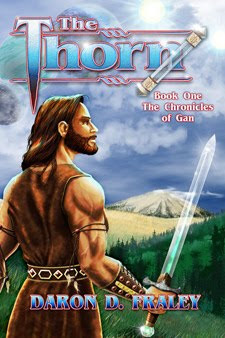 Because the names are scriptural, their use on the planet of Gan connects them too closely, for my tastes, to earthly names. POV-The point of view character changes gave me whiplash. There were a few times that I didn’t even remember who the view point character was and had to go back and search to figure it out. Because of the frequent change in POV and the randomness of the switching, I found it hard to connect with any of the characters, let alone feel empathy or jeopardy for them. Plot-The plot was predictable and unsurprising. The climactic scenes in The Thorn were disappointing and sometimes felt rushed. Much of the story was hard for me to swallow. I found it hard to believe that after one ruler was killed, thousands of people who had been taught to despise each other became instant friends. The “happily ever after” theme took credibility away from the story, for me. Pacing-Many times I was dismayed to read a “travel log” of irrelevant details that slowed the pacing of the story without providing character development or plot acceleration. I found myself skimming over large sections of text in an attempt to move on to the action. Fantasy-Because I am a fantasy fan, I love to read books that introduce clever ideas or places. The Thorn was set on another planet and I was disappointed that Gan was so similar to Earth. The few differences that distinguished Gan from Earth were creative enough(ie the moons and suns and the glow stones), but as a reader, the fantastic elements were not intelligently considered. There were no attempts to show how a planet might be affected by the orbit of multiple orbs, or explanation as to how the glow stones worked. Having said that, I realize that the level of fantasy is a personal preference-I know of several people who loved the fact that the worlds were so similar. I gave this book 1/5 stars. The idea of the story intrigued me, but the plot and writing of the story did not live up to my expectations. Even though this book was not for me, notice that I did give it a star. I realize that even though it did not hit the mark for me, there are those for whom this book will resonate. 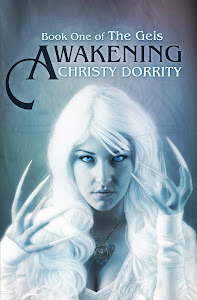 Please go to Daron Fraley’s blog to read other reviews of this book. I did want to make one slight clarification - this book isn't a fantasy, but is a religious speculative fiction, and so the elements that you would generally find in a fantasy won't be found here. Thanks again - it was fun to read your thoughts. excellent review, Christy. I also bought this book and am anxious to see what I think. Your review seems very fair and concise to me. Whiplash POV seems to be a common occurrence with small presses and I can't figure out why. I read a book by Covenant over the weekend, and while the book was great, the first three pages had three different POVs. The rest of the book switched between four main characters, with the occasional other character getting a turn with POV. I didn't like this either. I never gave POV much thought before, but now it makes me want to stick with 2 POVs, 4 at most, in my own writing. I saw your site whilst at the hop. An interesting blog, I love the fact that, like me, you have a bit of all kinds. Nice to have met you, best wishes P.W. I found it interesting that you described the men as weepy. They actually reminded me of how most of the U.S. reacted after 9/11. The fact that the main character's father was murdered and most of his city destroyed is certainly enough for me to see why the MC is emotional. The sub characters also deal with repentance and difficult trials. I thought the characters were very well balanced. Danyelle, thanks for reading my review. Yes, I can understand the emotional impact that the protagonist is feeling. It wasn't so much the emotion that bothered me as the timing and execution of it in the scenes. Sometimes the emotion came too late for me, I had already dealt with it as a reader.